SAMUEL LESLIE WEST, beloved husband of Shelley West, of Picture Butte, passed away peacefully surrounded by his family, at the Foothills Medical Centre, on Saturday, April 6, 2019 at the age of 64 years. Sam is survived by his daughters Sammi (Dave) Lutterotti of Lethbridge, Robberta (Marc) Perreault of Calgary, Amy of Jasper and Katie (Sean Maclean) of Lethbridge; sons Frank (Jocelyn) and Casey (Kristie) both of Picture Butte; grandchildren Hunter and Ottavio Lutterotti, Kade and Belle Perreault and Samuel and Nora West; mother Jennie West of Picture Butte and his mother-in-law Alice Bond of Rawdon, N.S. ; sisters Arlene (Wade) Bourne, Peggy (Les Hanley) and Laura (Joe) Metka; sisters-in-law and brother-in-law Celeste MacNeil, Charlie (Ardis) Bond, Avora (Earle) Babcock, Karen (Tom) MacDonald, Anita (Steve) Taylor and Ellie Smith (Ron Johnson). He was predeceased by his daughter Chelsey, father Frank, father-in-law Arthur Bond and brother-in-law Kirby Bond. Sam was born in Lethbridge, AB, and lived there until he was 12 years old. His family then moved to Calgary. After high school, Sam became a licensed auto and heavy duty mechanic, working for Aamco Transmission and Precision Transmission in Calgary. It was during this time that he met and married Shelley. Starting a family, they first moved to Lethbridge and then in 1985 to Picture Butte. Sam worked for Kunsman Transport in Lethbridge, Butte Motors and Farm Supply Ltd. in Picture Butte and then in 1991, started with the County of Lethbridge as the school bus mechanic. In 1995, the school board separated from the County and became Palliser Regional Schools, where Sam continued to work until his health forced him into early retirement. In 1988, Sam joined the Picture Butte Volunteer Fire Department. This is where he found his passion. For the next 26 years, he poured his heart and soul into being a firefighter. He quickly moved up through the ranks, becoming the Volunteer Fire Chief in 1996. Sam was also instrumental in starting the first ambulance service in Picture Butte. He made many lasting friendships through the fire department and through hose laying competitions. The only thing he loved more was his family. He was a proud and dedicated father, grandfather, son, brother and a very loving, understanding husband. He coached soccer, helped with first aid on his kids’ hockey teams, taught Sunday School and served on the Trinity United Church Board. The things he enjoyed most though were the camping trips, boating and family dinners where everyone gathered together. He was so loved and will be greatly missed. 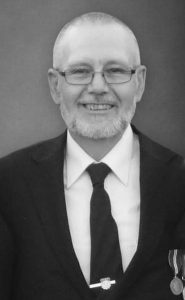 A Visitation will be held at CORNERSTONE FUNERAL HOME, 2800 Mayor Magrath Drive South, Lethbridge, AB, on Thursday, April 11, 2019 from 7:00 P.M. to 9:00 P.M.
A Funeral Service will be held at SOUTHMINSTER UNITED CHURCH, 1011 – 4 Avenue South, Lethbridge, AB, on Friday, April 12, 2019 at 2:30 P.M. with Reverend Glenda Wert officiating. Any fire service members attending are welcome to wear uniform. In lieu of flowers, the family asks those who are able, to consider donating blood in Sam’s memory. For those who cannot, donations may be made to Canyon Church Camp, 210A – 12A Street North, #418, Lethbridge, AB, T1H 2J1, to rebuild the chapel destroyed in the Kenow Wildfire. So sorry to hear of the loss of Sam he was a dear friend and mentor to lots of us in the fire industry. My thoughts and prayers are with the whole West family during this time of sorrow. I remember the love and adoration Sam had for his family. I could see such a glimmer in his eyes seeing his children grow into the people they are and watching his grandchildren play. I know he loved you all and felt your love in return. He had such incredible strength taking on his health challenges over many years. I am certain that is due to the love of this surrounding him in his journey. My thoughts are with all of those who are touched by his absence. The West Family, we are so sorry for your loss. We are thinking of you all during this difficult time. Sending our thoughts and hugs to each of you.